isn’t silver a little soft to be making firearms out of? silver plating is different. but straight silver? i dont think so. Yeah. When you run out of bullets you stab the vampire with this gun. Silver plating a firearm would be almost as retarded as making a whole gun out of one. Harry Callahan: I know what you’re thinking. “Did he fire six shots or only five?” Well, to tell you the truth, in all this excitement I kind of lost track myself. But being as this is a .44 Magnum, the most powerful handgun in the world, and would blow your head clean off, you’ve got to ask yourself one question: Do I feel lucky? Well, do ya, punk? I assume it’s nickel plating, not silver, unless there was an accompanying article specifying silver. 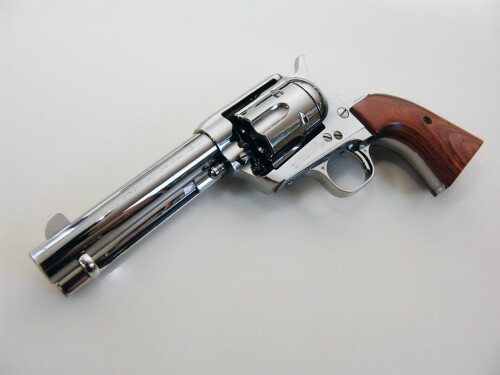 It could be chromed or stainless, but IDK if Colt ever made a SAA in stainless. And it *has* to be a mexican. No others would do that and only mexicans are are allowed to be disparaged in this thread. @dusktime: I’m just going by statistics. Who else chromes/gold plates entire motors and underbodies of cars?